With so much happening in the world around us, there's no denying that we all need an outlet to express ourselves. This blog has been creative and personal expression for me, and my big sister, Beth, has requested that, just for today, it be the same for her. This all started on a Monday night in February when my husband, Jonathan, called and said that he was being sent to Afghanistan. We had thought we’d be moving from Georgia to Kansas, but now we would have to wait for a year for all of us to be together in a home. I remember the love Jonathan expressed, saying he would understand if I could not wait. I remember telling him that after all we had gone through, this would be easy. Man, those words were both the best and the hardest things I have ever said. I knew that we would have a week with him and, in that week, we would have to buy a car (all of this because my bff thought that it would be a great idea to get rear-ended in my car the day after I was told that Jonathan would be leaving- thanks Ada! ), that we would end up doing more paperwork than I have ever seen, get all the stuff that Jonathan needed (which meant a trip to Columbus to Ranger Joes), get him packed, spend time with friends and family and- oh!- tell the girls: our young daughters, Mary Grace and Laci. All of this needed to be done on top of the fact that I had just recently started a new job as the general manager of a gym (which I was about to have to take a week off from). I’m the type of woman who freaks out over lost shoes (that are usually already on my feet! ), so the prospect of purchasing a car scared me to death. Put it this way: I would rather let Ada pull each and every hair out of my head with tweezers than buy a car with everything that was happening. As I prepared to go pick up my husband from the airport for us to embark on that hellish week, I had already told a fib to my girls about why I was getting dressed up that early, instead of just taking them to school in my jammies. I also forgot my wallet, and then proceeded to forget what airline he was on, as well. A kind lady informed me that, yes, my husband was on that airline, and then she took me as close as she could to where he would be…I received tons of phone calls offering love and support and, then, there he was…it was like a scene from the movies as I ran through the crowd to greet him, and, as I jumped into his arms, I heard people clapping (True story! It was amazing). Afterwards, we surprised the girls at school and there were tears from the kids and teachers. Note to self: never wear makeup with stuff like this going on. During the week, I can’t tell you how many car dealerships we looked at, or what made us get the one that we did, or how freaked out I was the whole time. I can’t tell you how, or why, we decided to tell the girls about Jonathan leaving (on a Tuesday instead of Friday) as we drove around in our Tahoe on the way to the circus. I can’t tell you how I kept my cool as we packed, or how I didn’t fall apart when Jonathan and his brother, Jason, sat on my bed talking about killer Army men stuff. I just managed to take a picture of that moment, and walk away with tears in my eyes, without them ever even knowing I had captured it. I can’t tell you how I was able to walk away from Jonathan at the airport, how I managed to meet BB (“battle-buddy”) with ease; nor can I explain how an amazing friendship with Lacy (BB’s wife) and family came to be, especially with them living all the way out in Texas. But I can tell you that I should have seen how God was holding me close much sooner than I did. 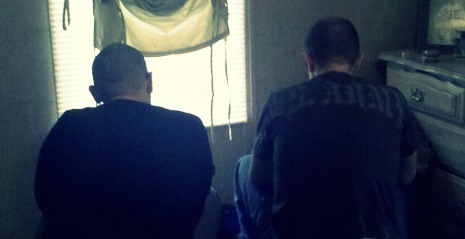 I can tell you that Jonathan and I held hands and talked and ate at Hooters, and held hands some more. The girls were told that their daddy was leaving (I somehow made it through with no tears!) and, that night, after wanting to go the circus for 10 years and never being able to go, we went together as a family. It truly was the “greatest show on earth”. Here and now, with the three of us living with my best friend Ada, I can share with you some of the little things, like how Ada turns purple from the tanning bed and sometimes gets sick as a dog, but she’s still able to tell me that the love I share with my husband is “epic” and sent from God (if you knew Ada, you would know she never says things like that, but she loves Jonathan). I can tell you that from February until this moment, I have been used up and heartbroken, but every other week the girls receive gifts from their daddy. I also have to tell them that “No news is good news”. I can tell you that the love of family and friends, and meeting people in the gym, has kept me going, and that our girls are really more amazing and much stronger than I could have ever thought. What I want to say, after telling you about my family, is this: regardless of your beliefs about war, think about what is going on with each soldier's family for just a moment. Please think about the kids who are affected before you put up your pictures or your statuses on Facebook, and know that, no matter how hard it is in your life, there is a solder somewhere making your life in this country possible. No matter what their family is going through, those soldiers are going through more with sand in their eyes, sleeping outside in holes, carrying 50 pounds on their backs at all times with empty bellies, missing hot showers and clean sheets and their families so much that it physically hurts. They do this for you and for me. They do it because they believe in something. 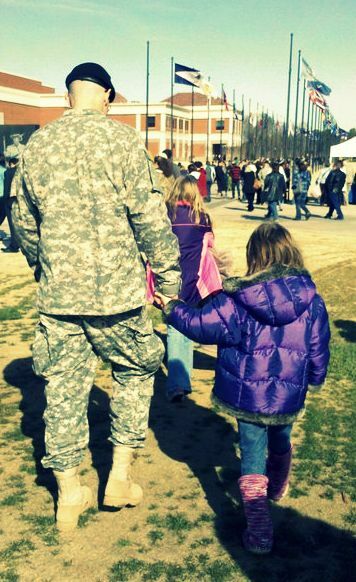 Remind yourself of my little girls, and all the other Army babies out there, and what they do every day…the pain they experience without their daddy to tuck them in at night and kiss their foreheads. 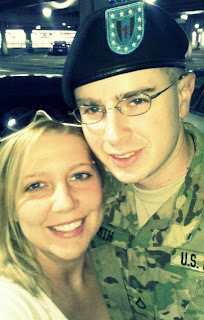 Think about how they keep going knowing that he may never come home, and remember that MY ARMY MAN helps keep you safe. Thank you my sister for letting me share..
Bless your ARMY MAN and all of the military men and women keeping our country safe for all of us.